Now it’s not hard to tell that I’m not a luxury travel blogger and a spot like Cinnamon Dhonveli Maldives isn’t my usual style of travel! I’m much more at home wandering around barefoot on beaches and hostels than I am sipping champagne anywhere with a dress code. But every now and then I indulge a little, treat myself or get the opportunity to check out somewhere a bit more luxurious…one of the perks of being a travel blogger I suppose! And when I headed to the Maldives for a surf trip there was one bucket list item I was keen to tick off – staying in an over water bungalow on a luxury island. After much research, Googling and budget checking it seemed Cinnamon Dhonveli Maldives was the perfect place to experience it! Why Choose Cinnamon Dhonveli Maldives? Lots To Do, Or Plenty Of Ways To Relax! Cinnamon Dhonveli Maldives – Was It Worth It? 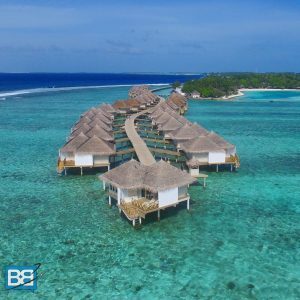 Choosing somewhere a bit more luxurious in the Maldives can be a difficult task – after all you’re dropping hundreds of dollars a night rather than just 10! Having stayed at a couple of Cinnamon Hotels during my trip to Sri Lanka they were a brand I trusted and I had a great stay with them, so when I found out they also had a couple of properties in the Maldives it seemed sensible to stick with what I knew. The problem then came that Cinnamon have 3 resorts to choose from in the Maldives – each with their own style and vibe! Cinnamon Hakuraa Huraa is the most northern of the 3 – about 45mins seaplane ride from the capital of Male – and is surrounded by a tranquil lagoon with a variety of watersports on offer. Ellaidhoo Maldives by Cinnamon is slightly closer to Male – 25mins by seaplane or 1.5 hours by speed boat – but struck me as the most luxurious and honeymoon like of the 3. If you’re keen on scuba diving this is the one to choose though, the house reef there is one of the best dive spots in the Maldives and is literally a stones throw from your room! Cinnamon Dhonveli on the other hand is only a short, 25 min speedboat from Male, boasts 5 dinning areas, 2 bars, heaps of activities but most importantly…it has surf! Erin Watching Me Surf From The Bar! There are few surf breaks worldwide that can guarantee a lack of crowds and people pay thousands of dollars to jump on surf charters in the likes of the Maldives, Mentawais and Indonesia to seek them out. 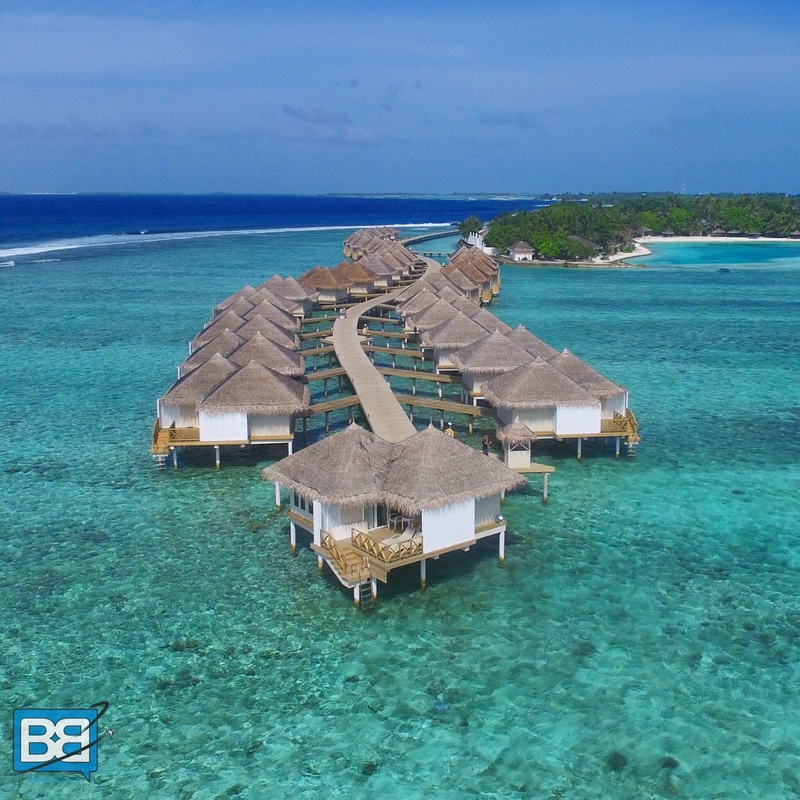 This is where I lucked out with Dhonveli – it has its own private surf break (the world famous Pasta Point) which is managed by the team from Atoll Travel and allows a maximum of 30 surfers on the island at any one time. And this famed left hand point break is a wave I’ve been dying to ride for years! But even if there are 30 surfers on the island you’ll still never find it too crowded as the Atoll Travel team run boats all day to a variety of other spots nearby – including Sultans, Jailbreaks and even spots like Cokes and Chickens if you fancy going further afield. In fact during my stay I had at least 3, 2 hour sessions where I was the only guy out! This was made even more amazing by the fact that from the water I could see about 6 surf charters moored up at Sultans (just off the next island) which was packed with surfers! Not A Bad Commute To The Surf! …except maybe a cold cocktail being handed to you at the bar as you step out of the water…which can also be easily arranged! If you’re looking for more info on the surf and stay packages from Atoll Travel keep an eye out for my surf review which is coming soon! Snorkelling In Front Of My Room! 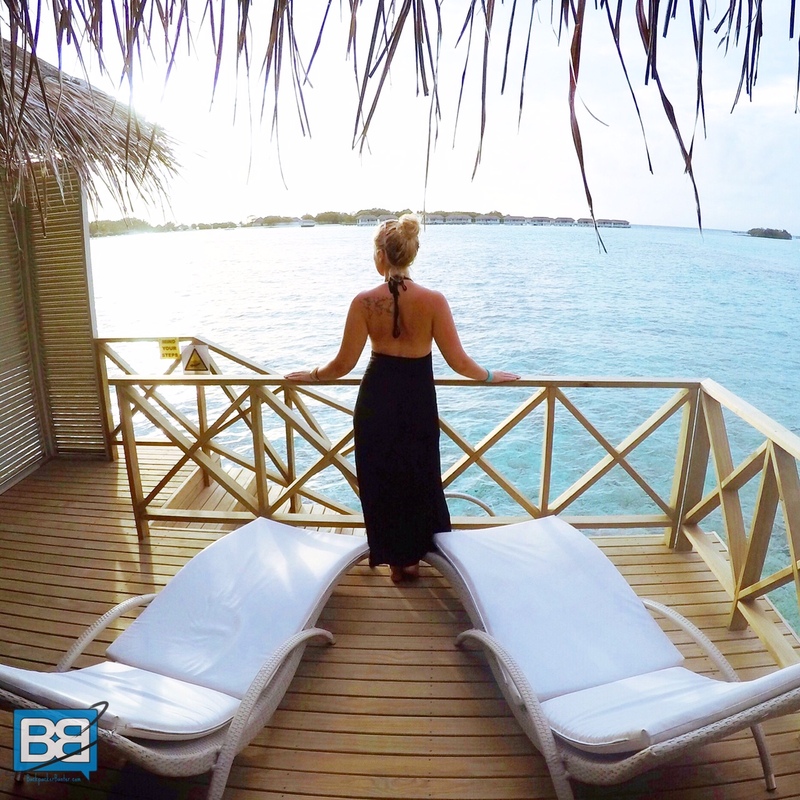 The main reason for splashing out in the Maldives though was to experience the luxury of staying in an over water bungalow – something I didn’t think I’d be able to tick off my bucket list for a few years yet! Cinnamon Dhonveli Maldives has 2 to choose from – a ‘standard’ or a ‘suite’. The main difference between the two (as well as the price!) 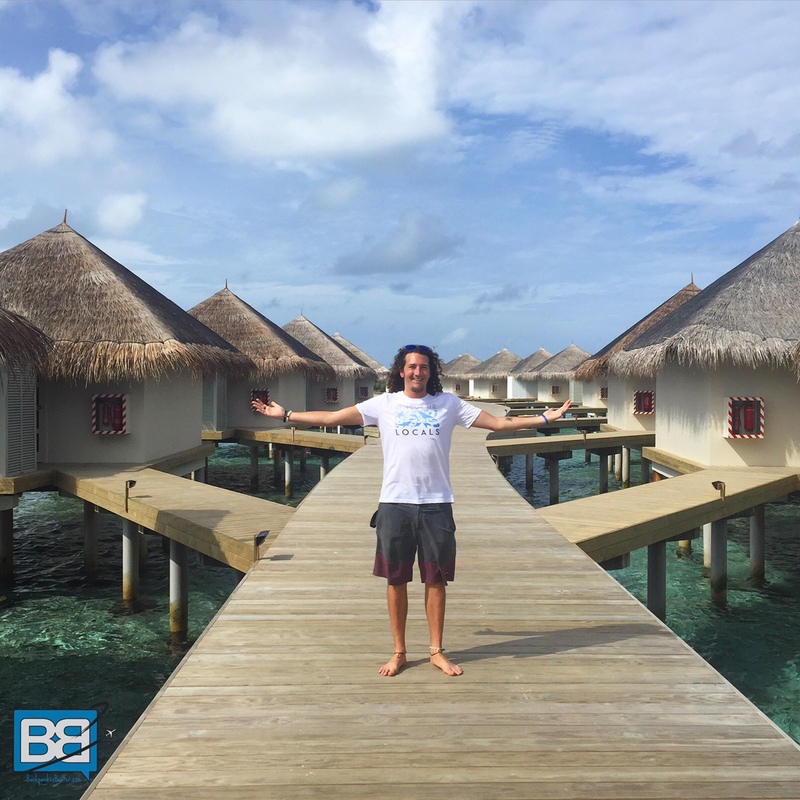 is the standard over water bungalows are slightly smaller, but are also the closest to the waves and the surf bar. There are no prizes for guessing which one I choose! 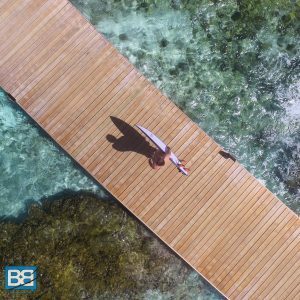 From the moment I stepped foot on the board walk which just out of the island and wraps around the reef I felt goosebumps – it was everything I had envisioned it would be. Shoals of fish, stingrays and even reef sharks cruised under my feet and it really was the slice of paradise I wanted. As you might expect it came with some incredible ocean views and no matter where you were in the bungalow you could see the water – from laying in bed to enjoying a spa bath. And of course the best place to soak up the views was the balcony, the perfect spot to enjoy a glass of wine and watch the sunset. Or you could always climb down the ladder and snorkel right in front of your room! Cinnamon Dhonveli Maldives has plenty to see you occupied no matter what your vice too. 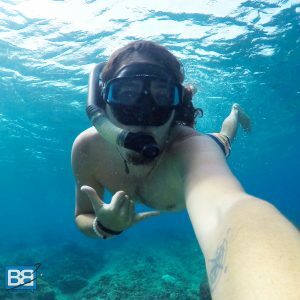 For those who are feeling adventurous there is an in house dive resort where you can give scuba diving a try on an intro dive, do your full open water dive course or if you’re already certified head out to some of the surrounding dives sites. If you’re lucky you might even bump into some of the local manta rays ! 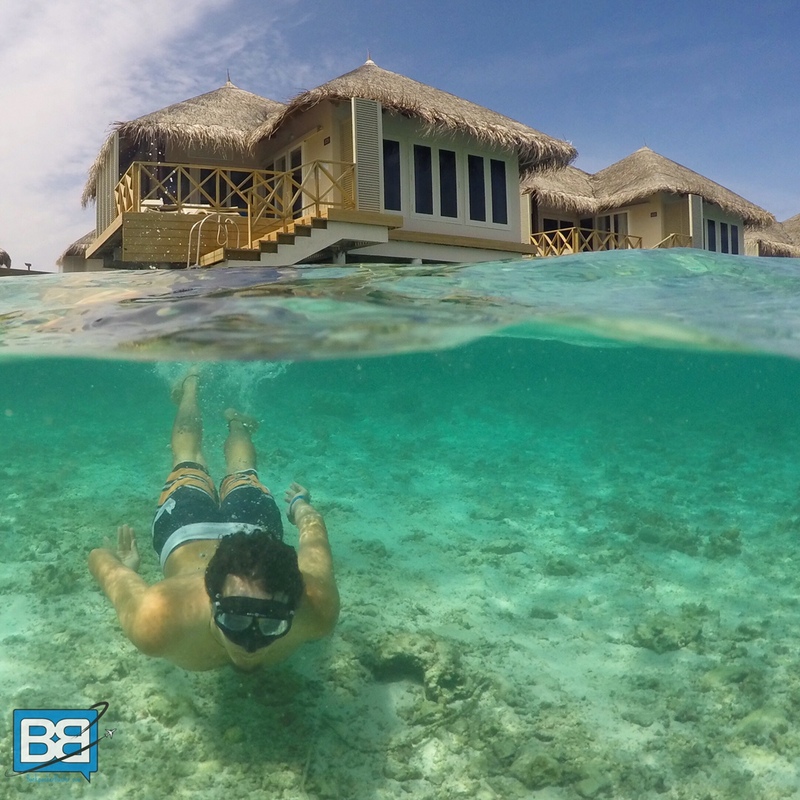 If scuba diving isn’t your thing there is also plenty of snorkelling to do too – both in the lagoon but also on some of the snorkelling trips to elsewhere in the Atoll. One of the most popular of which is the turtle snorkelling tour – so make sure you’ve brought your GoPro with you! But of course islands like this are also great for relaxing – and whether that means floating around in the lagoon, topping up your tan on the beach or chilling by the pool there are no shortages of spots to kick back on island time! …but if that’s not enough there is also an in house spa to pamper and spoil yourself at too! And of course you can also learn to surf here too under the expert supervision of the Atoll Travel Surf Team who will run you through everything. Even if you don’t surf though you can always kick back at the surfer bar and get a front row view of the everyone enjoying the waves whilst your enjoy a cocktail – pretty ideal for those with girlfriends or wives in tow who are finding a compromise on their trip! So what can you expect from the Cinnamon Experience? After all if you’re dropping dropping some serious dollar here! My experience was nothing short of amazing and I’d even go as far as saying that the staff were a huge part of what made our experience so much fun! From the chefs who greeted you with a smile at every meal and were always keen to hear how your day went to the stoke of the surf crew – everyone I met on the island were genuinely friendly and happy to help. The buffet style meal service meant you could refuel on a variety of food – from local curries and fresh fish to pasta and salads – there’s something to suit every taste. And of course the bars served up a variety of cocktails, beers and drinks from 10am until the last person leaves – cheers to that! Yeewww Birthday Water Bungalow Bliss! I must admit that I was expecting to be surrounded by honeymoon couples in their own little bubbles but I was stoked to discover that Cinnamon Dhonveli Maldives has a good balance of people from all over the world – couples, families, friends. The island is big enough and laid out in a way that allows you to find your own slice of peace and quiet if you choose or you can easily mingle with other guests and make some new buddies too. Well you can expect to pay from $371USD per night which will get you bed and breakfast for 2 in a Garden Bungalow through to $906USD per night for Premium All Inclusive Over Water Suite. In the end I went for all inclusive in the Water Bungalow which will set you back around $600USD per night. Seriously though I’d highly recommend going all inclusive – after all you only live once right?! Overall I was massively stoked with my stay at Cinnamon Dhonveli Maldives – it ticked all the boxes for a slice of paradise in the Maldives and even without the surf it would’ve been an awesome place to stay! So if you’re looking for an island retreat for your stay in the Maldives check out the latest rates and availability here! Check out the video I made which covers all the fun, sun and surf during my stay! PLEASE NOTE; I received a discounted stay at Cinnamon Dhonveli Maldives & Atoll Travel but rest assured all opinions are honest and my own. Awesome post. I’ll definitely be hitting up the Cinnamon hotels when I get out there to kayak. Looks like some great surfing. Beautiful pics. Thanks for the share! How often do you get out to the Maldives?